DAVID Brzeski lives on a hill more than a kilometre from the nearest water so when his dogs started barking just after midnight Monday, what he found upsetting them was the last thing he would have imagined. 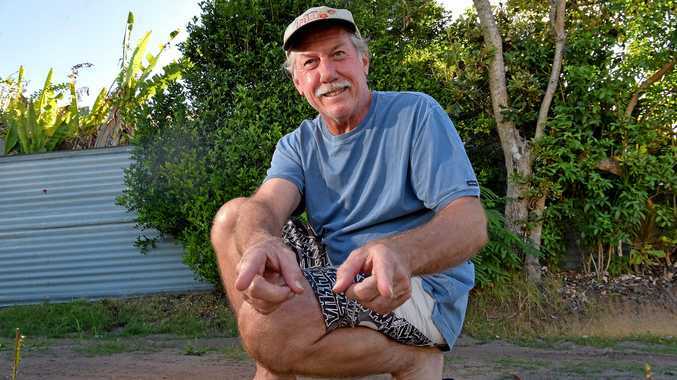 It remains debatable who had whom bailed up in the backyard of his Maroochydore home, but David said the mud crab he quickly named Max didn't take much urging to seek the sanctuary of a bucket he made available to it. "All my mates live on canal blocks and I'm the one catching the crabs," he laughed. David was in a deep sleep when the dogs started "going off". 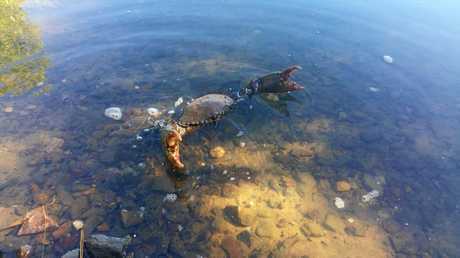 "Normally it's a possum or a snake but when I went out it was a mud crab snapping at the two dogs," he said. "The poor blighter was clapping his claws for all his worth fending off my curiosity-seeking dogs and he seemed quite happy to slip into a bucket." David thinks the crab may have escaped a pot after one of his neighbours caught it and brought it home rather than it having negotiated itself the distance it had travelled from the water. "He most likely smelt the Mudjimba sand I had delivered and had spread 24 cubic metres top dressing about a week ago. It had rained heavy in a storm Sunday arvo and was still quite wet." Whatever route took him to David's door, 'Max' couldn't have found a safer haven. David said he a had grown up crabbing with his grandfather 'Weeds' Ruster after the death of his own dad in 1971. His grandfather had instilled the principles of fishing sustainably and had taught him to release juvenile crabs so that they would grow to a size where they could be sold to the Brisbane markets. Max may have been bigger than the "little fella" David described but given what he had been through he couldn't eat him. "Don't get me wrong," he said. "I love a good feed of mud crab as much as you but I felt he deserved a second chance." 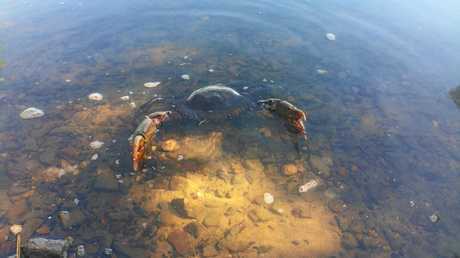 Max the crab was released into the Maroochy River yesterday morning.